The iPad 2 is finally here, and with it comes the inevitable onslaught of new cases and accessories. Of course, you know what this means: the inaugural iPad 2 Case Round-up from your friends at Macworld. And we've got a lot more than just Apple's own Smart Cover. Booq: The Booqpad Agenda combines an iPad case with an old-school sketchpad to give you the best of both worlds. It comes in four color combinations: black-gray, grey-green, or white-berry, which cost $50 each, and coffee-cream, which costs $100. Sketchpad refills are available in a variety of paper formats and cost $10 for a three-pack. All models are slated to be available on March 25. Case-Mate: From minimalistic to luxurious, this company has announced a full line of iPad 2 cases, starting with the aptly-named Simple ($35), which offers a retro-Eighties look with its squared-off design and solid colors—black, orange, or blue. The Leo ($100) is a veritable blessing for your business trips. In addition to acting both as a case and a stand, this leather carrying case includes enough pockets and sleeves to turn Mary Poppins red with envy. The $50 Venture, on the other hand, sports a flashier look and provides a simpler user experience without foregoing protection. Handstand: Although the maker of the Handstand case, designed to make it easier to hold the iPad, has not announced concrete details about iPad 2 products, the company told Macworld that it plans to produce a model compatible with Apple’s new tablet. The new case should be available a few weeks after iPad's official launch and will sell for $50. iSkin: iSkin’s existing Q.West collection of iPad sleeves, slings, and folios ($50 to $195) is already compatible with the iPad 2. iSkin has also announced that it's in the process of adapting its Duo, Vu, and Aura cases for Apple’s new tablet, although the company has not announced availability or pricing for these items. The Miniot cover offers Smart Case-like functionality and is made from a single piece of solid wood. iLuv: While many other makers are still in the process of creating their new products, iLuv is ready to ship them—before the iPad itself. The company has announced the iCK826 ($130), which comes with a fully-detachable Bluetooth keyboard, and the iCC818 Flex Gel Case a line of snap-on cases that comes in black, grey, white, pink and blue—each retailing for $40. For a portfolio look without the keyboard, the $50 iCC816 comes in black, graphite, or brown. The company is also shipping the iCC2011 ($40), a foam-padded neoprene sleeve available in black or pink, and the water-resistant iCC2010 ($25), which comes in seven colors, including lime, mango, pink, grey, or black. Kensington: The company is announcing a trio of releases for the iPad 2, with a release date slated for April. First up is the KeyFolio ($100), which features a design that combines a rechargeable Bluetooth keyboard, a folio-style case, and a landscape-mode stand. If you’re not looking for a keyboard, the company is also planning to introduce a more traditional Folio Case ($40), as well as the minimalistic, rubber-built BlackBelt ($40), which wraps around your iPad to protect its edges without adding significant heft or weight to the device. Marware: The CEO Case combines a hardshell exterior with a padded interior in a folio design capable of doubling as a stand, typing platform, and hand strap. The case costs $50 and is available for pre-order directly from the company’s Website. No ship date has been announced. Miniot: You may be wondering whether Apple has kept its Smart Cover secrets to itself. I'm pleased to inform you that at least the folks at Miniot have managed to crack the code. They plan on introducing the Miniot Cover, a $69 accessory that looks and acts like the Smart Cover but comes in five different varieties of real, wood—smoked oak, walnut, cherry, padouk, and mahogany. Miniot will also offer free laser engraving for its upcoming case, which is made out of a single piece of high-quality wood. No release date has been announced. NLU Products: The makers of BodyGuards and ScreenGuardz protective films are coming out with iPad 2-compatible versions of their products priced at $20 or $30, depending on the model and features. The new accessories are currently available for pre-order and should ship on March 11; for a limited time, NLU is offering a 15 percent discount to customers who use the promotion code iPad2 at checkout when ordering from the company’s Websites. 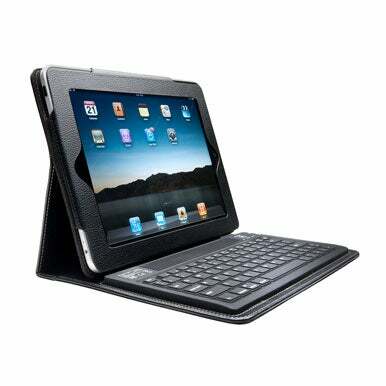 Kensington's KeyFolio comes with a detachable Bluetooth keyboard. Scosche: For a complete line of accessories built with the iPad 2 in mind, look no further than Scosche, which is announcing a veritable smorgasbord of products. Our interest, however, is focused on its cases, like the Fold IO P2 ($45), a folio that features a carbon-fiber or leather texture for maximum protection. The case supports multiple viewing angles as a stand and will be available in black or white. For a more colorful look, you may want to take a peek at the GloSee ($40), a flexible-rubber snap-on case that comes in blue, smoke, purple, pink, or clear. If rigidity is what you’re after, the company’s SnapShield ($30) features a polycarbonate body and comes in the same range of hues. All of Scosche’s iPad 2 products are available for pre-order now and are slated to ship mid-March. The Breve, from Tom Bihn, sports two padded pockets for your accessories and mobile phones. Targus: The accessory maker is introducing an iPad 2 version of its 360º Rotating Stand/Case ($60), which combines a hardshell with a soft interior, along with a stand that rotates to work both in landscape and portrait orientations. The VuScape Cover & Stand ($40) can't rotate but still uses a hardshell design and can double as a stand. Finally, the Protective TPU Skin ($25) is a thin-but-sturdy, snap-on case that will protect your new iPad from scratches and bumps without blocking access to any of its ports. All products will be available soon. 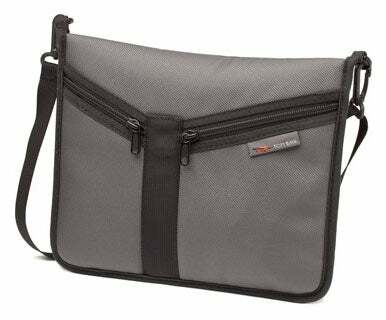 Tom Bihn: The Breve ($55), available in black or steel, is a hand-stitched satchel made entirely of ballistic nylon that also features two ultrasuede pockets designed to fit accessories and mobile handsets.